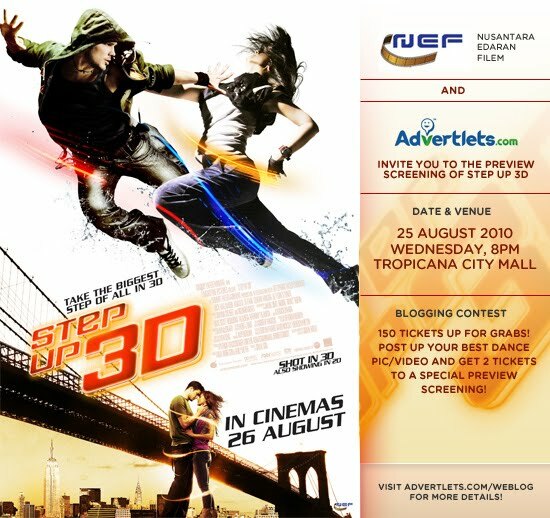 Advertlets Presents Step Up 3D movie screening this 25th August 2010! Advertlets.com is giving up 150 free tickets for Step Up 3D screening. Well,I had watched almost all of the dancing movies including Step Up 1 and Step Up 2. I love Honey and Make It Happen too. I love to dance and i wanted to win the free tickets (: It's been 13 years i had learn ballet and latin.I was almost gave up because i was to hectic for other classes too but well,my teachers always ask us to think positive and think of no pain no gain. I am trying my luck and i hope i could get the tickets :D teehees. 1. Post a dance photo in your blog post in the best creative way as you can and tell us why you want to watch the movie.